The three things leaders can do to activate greatness in others. The power of and how to listen behind the words for emotion and commitment. How to get out of the problem so you can find better solutions quicker and how to give more effective feedback. 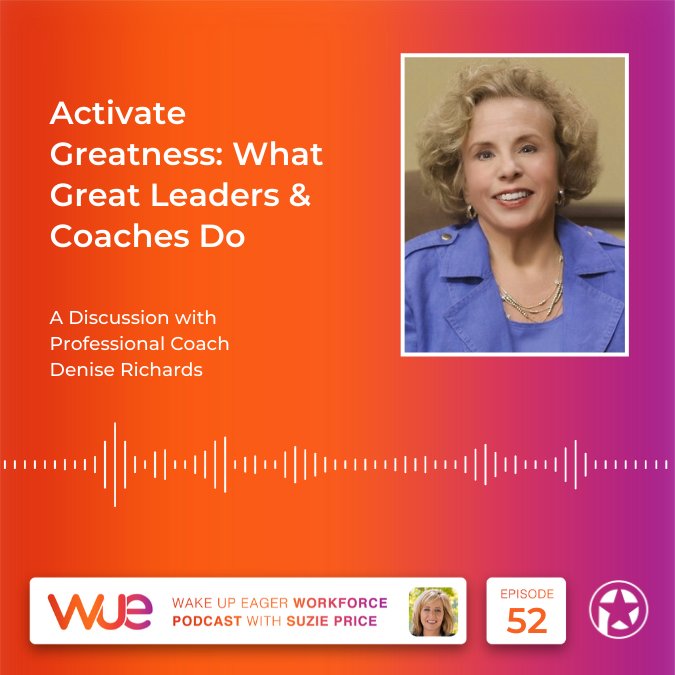 Topic 1: Top three things that leaders and coaches can do more of to activate greatness. Listen for their commitment for the positive intention behind their words. Topic 2: How does it help you serve others when you take a stand for their greatness? When we stretch ourselves, there's going be a point in which we waver or wobble, the key is to not get sucked into the wobble, stay focused and be a reminder of their vision. The first thing that comes to mind is what's wrong, what's not working right. Your first thought is not always your best thought. It's easier with clients than it is with family, positive distance. Topic 4: What are some of the things that you say to yourself or that you help others do to make sure that their agenda is first and foremost? You aren't successful if you aren't happy too. Don't get sucked into their story of why they can't do something. Keep their commitment and their vision in mind. Affirm their strengths, even when they don't see them themselves. Set an end result.Clear communication. The commitment and vision behind the words are more important than the words. Topic 5: A different way of listening. Be absolutely present in the moment. Turn off all the distractions. Listen to what they're saying, not what you want to say next. Distinguish between what your head is saying and what your gut or your intuition is saying. Topic 6: How to get out of the problem. You can't be in the energy of the problem and find the solution from there. Talk about the problem, complain about it, go neutral and then move towards a solution. Topic 7: Reasons it is hard to listen and activate greatness. We're attached to our solution versus being attached to the outcome. Topic 8: How being humble ties with acknowledging strengths or not acknowledging strengths. Ask to give a suggestion. Topic 9: Secret to affirming strengths while giving feedback on improvements. Make a request for change, not a demand. Topic 10: Who influenced you to your greatness? What did they say? Landmark Education Seminar Leader, Doug. He refused to see me as my “little self,” and challenged me, he saw me as bigger than my problems. Lovingly, but firmly challenge someone. Topic 11: What books or training programs have been most instrumental to your development? Topic 12: When you think of the word successful, who's the first person that comes to mind? Successful to me, means happy, we can be successful in the terms of the trappings in life, what is our position in life, how much money we're making, all those kinds of things that people typically call success, and for me, success is my ability to move through life happy, doing work that I want to do, making a difference in people's lives and doing it from a space of a happy, energetic being. Topic 13: Getting to know Denise Hedges. A funny story your family tells about you: Five year-old open-heart surgery story. What would your billboard say? Where would it be? : “Believe in yourself, trust in yourself.” It would be everywhere. Last bit of wisdom, advice that you want everybody who's listening to take away about activating greatness: We are all tempted to go into what's wrong, what needs to be changed? Know that that’s a default and comes with this organism called a human being, that’s okay, and your first thought is not always your best thought. Put that aside and focus your time and energy on your strengths and what they're doing well, and hold the vision, the end result vision of what you want and what it looks like even when you don't know exactly how you're going to get there.